From the plains to the peaks, from the airport to the ship, and from the snow to the desert. 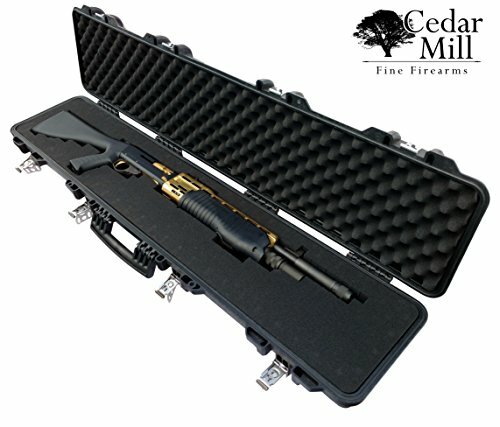 Our rifle case has you covered. Made with corrosion proof stainless steel and DS3 Resin, and full swivel handles, our case is ready to go wherever you want to take it. Our virtually indestructible design comes with our lifetime support, and our unique foam is customizable to every need you could have. Our unique stackable design allows for tight packing, sturdy stacks, and is perfect for deployment, travel, moving, and storage. DS3 RESIN and STAINLESS STEEL: Unlike cheap cases that will crack, chip, and break under stress, our case is engineered for Strength and Durability. Made to flex but not break. This keeps your valuables safe from impact by distributing the pressure over a larger area, deceasing the pressure per square inch (PSI). Stainless Steel Clasps hold the case shut in any conditions, and will not fail! 48" X 9" X 4" : To fit some of the largest Rifles and Shotguns. REPLACEBLE FOAM is easy to get and more affordable than our competitors. So if at some time you decide to change your configuration, it is easy and cheap to do. 100% SATISFACTION GUARANTEE: Our case is backed by a LIFETIME WARRANTY, and your satisfaction is our priority. We often offer quantity discounts for purchases of more than 1. Add them to your car to see what discounts are available. View More In Sports & Fitness. If you have any questions about this product by Cedar Mill Firearms, contact us by completing and submitting the form below. If you are looking for a specif part number, please include it with your message. © 2019 - wander-soul.net. All Rights Reserved.